The Niagara region is well known around the world for its incredible wines. Wineries dot the region and tours and tastings are among the most popular pastimes for most visitors to the area. All types of wines are produced here, but there is one variety that many might not be familiar with. This is Niagara’s famous icewine. While it is produced in other parts of the world, Niagara’s icewine is likely the best known. If you’re a wine lover and plan to taste your way around Niagara, here’s all you need to know about this surprising and delicious wine you can try when you visit Niagara. As with many types of wine, icewine producers must follow strict guidelines from growth to fermentation. Only a select few varieties of grape can be used for icewine production, and these include Riesling, Vidal Blanc, and Cabernet Franc. To a lesser extent some vintners use Chardonnay and Cabernet Sauvignon. 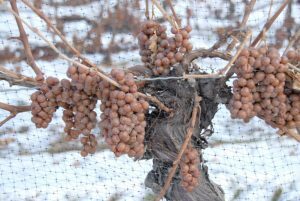 As with all wines, growing conditions must be exact and the Niagara region has the perfect climate for icewine. Mild summers and winters that aren’t too cold create the ideal environment. Icewine has a very distinctive growth and harvesting process, and you might guess part of it by the name. In late fall the vines are covered with nets to protect the grapes from hungry birds then the winemakers wait for the cold snaps to hit. A consistent temperature of -8 Celsius allows the grapes to freeze and begin to dehydrate. Once the temperatures reach -10 to -12 Celsius it’s time to harvest. 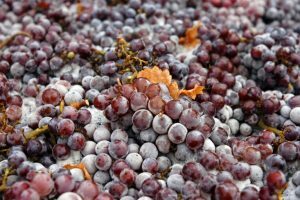 Since the grapes have dehydrated they don’t produce as much juice as other grapes, but the juice they do yield is much more concentrated and sweet. Due to the high sugar content, the icewine grapes can be difficult to ferment and this results in lower alcohol content. Icewine is very sweet and is generally considered to be a dessert wine. However, many unique cocktails feature icewine as an ingredient, so you can experiment on your own or ask your favorite bartender if he or she uses icewine in any of their creations. Where Can You Try Niagara’s Icewine? Wineries all around the region offer icewine as part of their stock so choosing just one is difficult. The good news is that you don’t have to choose just one; winery tours often include several stops so you can taste the product for yourself and even purchase a few bottles to bring home. The Ice House Winery is one of the region’s newest establishments or you could visit one of the first Ontario wineries to produce icewine, such as Inniskillin Wines. However, if you want to get a true feel for the industry a winery tour is definitely your best choice. Many of these tours can be customized for groups or special events and many include appetizers or meals to pair with the wines. On your next visit to Niagara Falls be sure to explore the area’s wineries and try its most famous creation, icewine. Not only will you have a great time in the area you’ll get a taste of what Ontario is all about.